Fill the form out below for the best professional limousine quotes in the area. 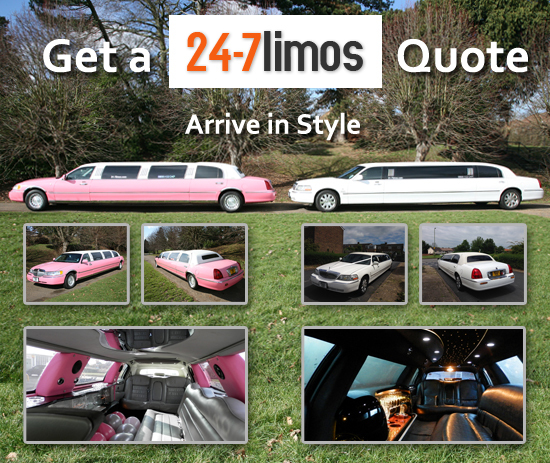 We will get back to you with a full, competitive, luxury limo hire quote. Whatever type of limo service you’re looking for we can tailor-make a service to suit your exact requirements. Please contact us to discuss any aspect of your booking and let us help to make your 24-7 Limo experience one that you’ll always remember. If you would like to discuss any detail of your limo booking please call 24-7 limos today on 0800 1123 247 or fill out the online enquiry form and we’ll contact you regarding your booking. Contact Us & Book a Limo Today.